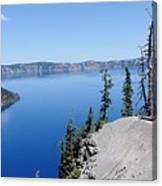 Crater Lake Scenic Panorama is a photograph by John Kelly which was uploaded on August 24th, 2014. 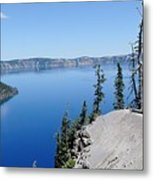 Wide angle panoramic photo of Crater Lake showing Wizard Island surrounded by deep vivid blue water. A lone crow sits on top one of the trees rooted to the rugged cliffs. Crater Lake was was once a towering volcano called Mount Mazama that erupted and collapsed then evolved to become the deepest lake in the U.S. At 1,943 feet deep, Crater Lake is the deepest lake in the United States and one of the ten deepest lakes in the world! The lakes water supply is only from rainfall and snow melt, some 40-50 feet of snow falls annually around the lake which helps to keep its 4.6 trillion gallons of water topped up. Wizard Island, partial remnants of the eruption, provides a stunning focal point that helps to add a degree of scale to this striking landscape scene. There is no place on earth that combines the depth and purity of this lake, the deep vivid blue of the water enveloped in rugged steep cliffs that rise to nearly two thousand feet in height. 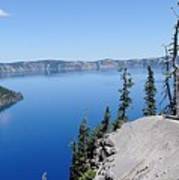 A place of immeasurable beauty that you will look on with amazement and awe, that's Crater Lake in Oregon, USA. If you enjoy my photography and art please sign up to my e-mail list where you can be first to find out about new images released. You can access this via short link here: https://bit.ly/2zQtsBr Thank you! Copyright © John Kelly Photography (UK), all rights reserved. Watermarks do not show on purchased products.